Sarah Jane Rothenfluch was the executive editor of news for Oregon Public Broadcasting and the executive producer of OPB's weekly arts radio show, "State of Wonder." 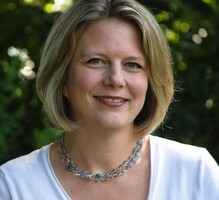 Sarah was a part of OPB's daily talk show, "Think Out Loud," including many years as executive producer, from when the show launched in 2008 until early 2015. She moved to Portland from San Diego where she worked for the NPR and PBS affiliate, KPBS. During her three years there, she worked as the station's special projects producer and as the senior producer of the daily show, "These Days." Originally from Canada, Sarah spent a number of years at the Canadian Broadcasting Corporation as a producer for numerous national shows, including "This Morning," "Sunday Morning" and "Richler on Radio." She also spent five years as a television field producer for "TVOntario." Go inside the Oregon State Penitentiary to find out about how college courses are affecting inmates. FRIDAY: We revisit our show from inside the Oregon State Penitentiary where we learned about the College Inside program. WEDNESDAY: Shenk's new book "Powers of Two" analyzes how creativity and innovation work in partnership. MONDAY: Calvin Trillin was the first speaker in the Literary Arts lecture series 30 years ago. He joins us today to talk about his writing career. WEDNESDAY: In the wake of Robin Williams' death, we'll explore what it's like to live with depression. WEDNESDAY: We get the latest on the Columbia Gorge fire that has caused evacuations in the Oregon town of Rowena. FRIDAY: Dave Miller talks to Dominican-American author, Julia Alvarez, at Literary Arts. Sebastian Junger's new documentary Korengal premiered in Portland recently. Junger sits down to talk about his new film and discuss larger questions about war. THURSDAY: During finals week, we go inside the Oregon State Penitentiary to find out about the College Inside program. WEDNESDAY JUNE 4: Award-winning journalist, Sebastian Junger, talks about Korengal, his new documentary about the Afghanistan War. MONDAY: Jack Ramsay died at his home in Naples, Fla. on Monday. We'll talk about his basketball legacy in Portland. FRIDAY: Jian Ghomeshi, the host of CBC Radio's program Q, is in town for a special taping of their show. He joins us to talk about his story and the success of Q.
WEDNESDAY: Where did you choose to birth your child, and why? WEDNESDAY: Jayce is a female-to-male transgender student at George Fox University. Should he be able to live with male friends on campus? THURSDAY: Dave Miller talks to Dominican-American author, Julia Alvarez, at Literary Arts today. TUESDAY: Scott Nelson, the Oregonian's business editor, talks about the stories that are capturing his attention. MONDAY: What's the best way to memorize something? Following the US Memory Championship, an expert shares his strategies. Think Out Loud invited veterans from the wars in Iraq and Afghanistan to join in conversation with author Phil Klay. Together they explored what it meant to return home after war. Reporters soon will be compensated based on how their stories play online.